President Donald Trump will not certify Iran as in compliance with the landmark nuclear agreement, but will stop short of fully withdrawing the United States from the deal, according to senior Trump administration officials who told reporters Thursday evening that Tehran is about to be hit with a harsh new set of sanctions targeting its support for terrorism. After weeks of debate and tense internal discussions, Trump has decided not to certify Iran as in compliance with the deal, a move that sets the stage for Iran to either renegotiate portions of the agreement or face increased congressional scrutiny. Secretary of State Rex Tillerson, in a joint brief with White House National Security Advisor H.R. McMaster, announced the president's decision to decertify ahead of a Friday afternoon press conference in which Trump will spell out his intent to toughen restrictions on Iran's nuclear activities that were left untouched by the Obama administration as it negotiated the original Joint Comprehensive Plan of Action. Trump's policy punts the issue to Congress, which will have to decide whether to reimpose a large set of nuclear sanctions that were lifted as part of the agreement. Such a move is likely to force Iran to walk away from the agreement. 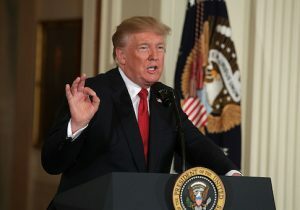 The Trump administration says it is now urging an alternate course, one that keeps the United States a party to the nuclear agreement while providing a parallel set a new laws that would force Iran to provide greater access to its contested nuclear sites. "We will stay in the JCPOA but the president is going to decertify under" the Iran Nuclear Agreement Review Act, or INARA, the key piece of legislation that requires the White House to certify Iranian compliance with the nuclear deal every 90 days. "The president has come to the conclusion he cannot certify under INARA" that Iran is living up to all of its commitments under the deal, according to Tillerson. By declining certification under this law, Trump is handing the issue to Congress for increased scrutiny. The White House is now recommending that Congress alter INARA to include "very firm trigger points" to address Iran's continued pursuit of ballistic missile technology and ongoing obfuscation on the nuclear front. Such a move would create a parallel nuclear agreement that addresses what the Trump administration views as key flaws of the original accord. Congress could write new provisions regarding ballistic missiles and other activities that would force Iran to provide greater transparency or risk a snapback of all major sanctions, including those that were lifted as part of the original nuclear agreement. These would include "trigger points that are specific to the nuclear program itself, but also deals with things like their ballistic missile program," according to Tillerson, who explained that this course of action would address the JCPOA's major flaws and give Congress a larger role in ensuring Iranian compliance with the deal. Tillerson also advocated new restrictions that would erase provisions of the nuclear agreement known as sunset clauses. These are parts of the original agreement that permit Iran to resume key nuclear weapons work within the next several years and also give it the ability to legally buy and transfer arms. If Congress alters INARA to account for these provisions, it would create a parallel set of laws that negate these sunset clauses, according to the Trump administration. "We're never going to accept them resuming their nuclear weapons program," Tillerson said. Amending INARA "puts more teeth" in the JCPOA and "does send a strong message to Iran that these are requirements the U.S. feels are necessary to ensure you never have nuclear weapons," Tillerson said. "It puts much more stature behind this expectation we have of Iran that currently exists under the JCPOA." Asked if Congress is up to the task, Tillerson expressed hope, but admitted, "We don't want to suggest this is a slam dunk up on the Hill. It is not." When pressed further on the rationale for not certifying Iranian compliance with the agreement, Tillerson said that administration does not dispute that Iran is in "technical compliance" with the JCPOA. "One of the weaknesses," he said, "is the bar, the standard to remain in technical compliance has not been that difficult for them to meet." However, "it is difficult to gain full access to sites throughout Iran and gain access to sites on a short term basis" due to provisions in the agreement that give Iran more than a month before permitting inspectors into contested areas. The administration intends to demand "access to research sites no one was asking before. We're leaning hard into the agreement," according to Tillerson. "They can trust we'll never do a deal again this weak." As part of the effort to crackdown on Iran beyond the nuclear portfolio, the administration will impose harsh new sanctions on the Islamic Revolutionary Guard Corps, or IRGC, Iran's primary fighting force. However, as the Washington Free Beacon first reported on Wednesday, the administration will stop short of extending a terror designation to the entire IRGC, despite a law on the books mandating the administration do so. Tillerson told reporters the administration had "considered" designating the IRGC, but that there "are particular risks and complexities with designating an entire army of a country." The intent is to "curtail the IRGC's ability to finance its terrorist activities," according to Tillerson, who said new sanctions will hit IRGC-backed entities and individuals. Tillerson's statement appeared to conflict with comment from a senior White House official on Thursday, who maintained the administration would in fact fully implement congressional requirements mandating it extend a terror designation to the entire IRGC. The Trump administration's Iran policy—created after a months-long inter-agency review—extends far beyond the nuclear agreement. U.S. officials say the strategy hinges upon ending Iran's regional interference in Syria, Yemen, and other countries, as well as the Islamic Republic's support for the Hezbollah terror group and its illicit transfer of militants across the region. "We are concerned about addressing these elements which have gone, by and large, unaddressed in the past," Tillerson said, noting that the former administration's policy focused solely on the nuclear portfolio and downplayed Iran's terror operations.